Writing in The Guardian, Giles Foden observes that "Information technology can be the friend of writers, but more often it is their worst enemy." Say you are a novelist. You should be thinking of language and technique. That is your calling, or your business, depending on how you look at it. In either case, you should be trying to hang on to the informing impulse that blew life into your idea. That original "inspiration" is how you will add to the stock of human knowledge. It's a gift. Do you receive it graciously? No: you think of fonts and hard drives. But, he continues, "All that notwithstanding, there are times when one does want the most up-to-date software as a writer." I run Eastgate System's amazing program Tinderbox for research and note-taking. It is effectively a relational database with a graphical user interface: so one is able to display or map all the various levels of one's notes, as well as links to the internet and other material. As a content management system, Tinderbox is very clever and elegant. The visual "box" of each note is also a file, so it can be saved into as well as moved around the screen....In some ways, Tinderbox is a little like the Copydesk/Quark Despatch system used for making up these newspaper pages: each article is both a quasi-analogue visual object on the screen and a digital file in itself. Of course, it is all digital really, but human beings aren't. Which is why this sort of programming is becoming more and more common. Michael Bywater gathers research notes from many sources. My work is mostly narrative non-fiction and my workflow is like gold-panning. Everything gets thrown into DevonThink Pro (including scanned stuff), or Yojimbo, or Journler. Other collection-buckets are my digital camera and digital recorder; they go into Devon, too. He carefully reviews the notes (he jokes that he knows the notes for his next book by heart) and gradually incorporates them into Tinderbox. Bywater lets Tinderbox lend a hand when integrating new notes, using rules to adapt note names and to automatically fill in metadata. 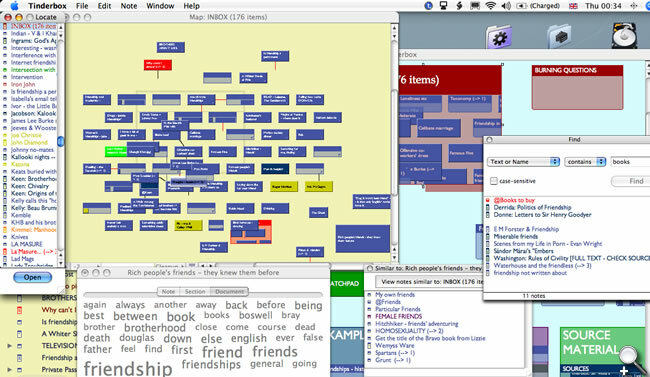 Near the bottom of the screen, Bywater uses the Tinderbox Common Words window to build a live tag cloud of his notes, and the Similar Notes window to suggest interesting links. Tinderbox maps and outlines combine to provide a live and lively picture of the emerging book. Later, Bywater gathers his notes into Scrivener and then writes in Mellel, dispatching pdf documents to his publishers. No single tool can meet all his needs, but he finds the combination effective. From formlessness and void, through chaos to structure and elegant representation. And who would have dreamed it in 1972?